Please return frequently to monitor the progress of our youngest historians who are involved in multiple projects. See the students at work by scrolling down to view projects, videos, and slideshows. Advocacy begins early at P.S. 48! In Spring 2017, students became archaeologists! 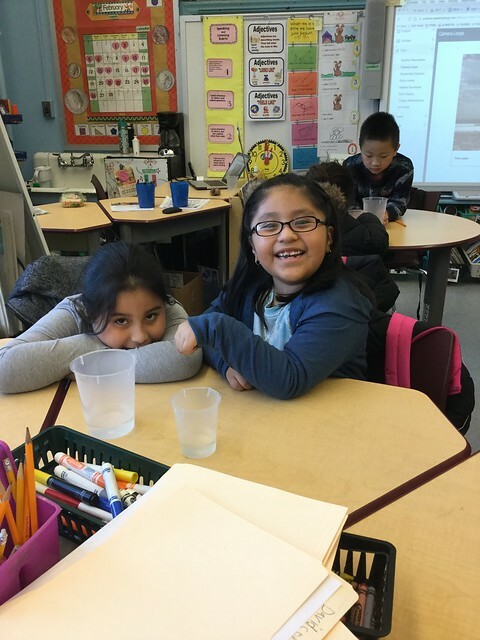 During the South Bronx English Intensive Sessions after school program sponsored by PS 48, developed analytical skills and career-readiness, alongside literacy, science, and mathematics understandings as they researched historical artifacts from archaeological digs in New York City. These skills contextually prepare the students for critically investigating the Hunts Point Slave Burial Ground Project during May and June. The student research culminated in a student-led Drake Park Needs Assessment, where students designed improvements for Drake Park, site of The HPSBG. 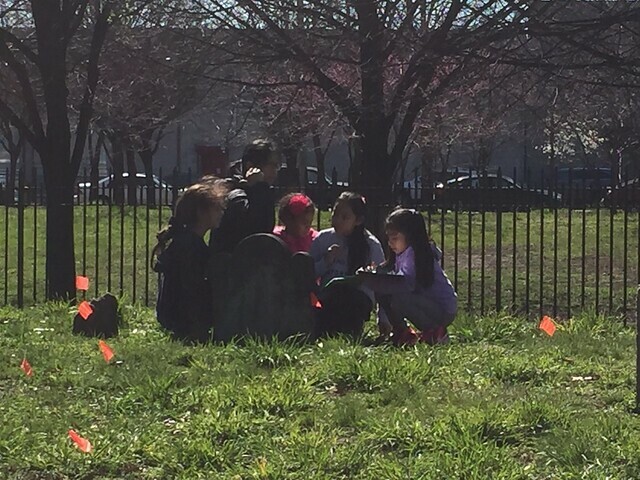 Students during Spring 2016 engaged in authentic, hands on archaeological research in collaboration with Jessica S. MacLean, PhD, RPA Archaeologist, resident archaeologist for the Hunts Point Slave Burial Ground (HPSBG) Project housed at PS 48. 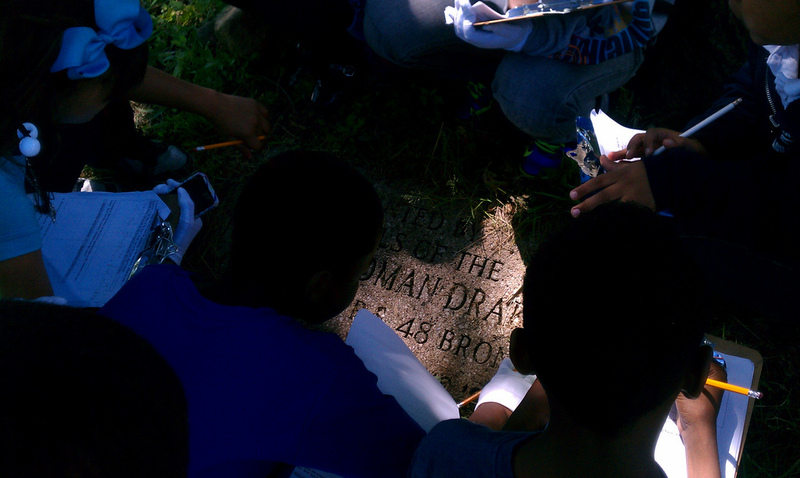 Students conducted an inventory of the gravestones in Drake Park. This included investigating geologic concepts (science), documenting each headstone through photographs (literacy, technology and art), mapping their locations (literacy, mathematics, geography, technology), and transcribing information located on the inscriptions (literacy, art). View the program's curriculum and media. Historic and Modern Hunts Point K-3 from Mr Czarka on Vimeo. Historic and Modern Hunts Point K-2 from Mr Czarka on Vimeo. View the video of young historians from PS 48 in Hunts Point neighborhood of The Bronx, New York, investigating historical documents related to the Hunts Point Slave Burial Ground Project. The students even interview a young professor in the process! Spring 2013 HPSBG Project from Mr Czarka on Vimeo. Young Historians Create a Book on the History of Hunts PointCome and learn about the history of the neighborhood of Hunts Point in this experimental educational project to connect HPSBG to the primary grades. Second grade students publish a class book Hunts Point Then and Now. Student create a visual representation of the HPSBG Mission. It is a work in progress but impressive nonetheless! HPSBG Mission from Mr Czarka on Vimeo. Click the picture below to view the progress of the Hunts Point Slave Burial Ground Project.